In honor of my Gram’s birthday this week and with Thanksgiving on the horizon, I thought I’d share one of her recipes, which is probably our family’s absolute favorite. When it comes to stuffing, we all know the debate of in or out of the turkey, well Gram solved the debate in the best way possible – stuffing muffins. She whips up her famous stuffing and then bakes them in individual muffin cups. Why is this so amazing? Because it gets crunchy on the outside while staying fluffy and perfect on the inside. Who doesn’t love that? Gram has now passed the torch of stuffin’ muffins over to me, and Cowboy and I are expected to show up at the holidays pans in hands. Even Cowboy’s sister is a convert. 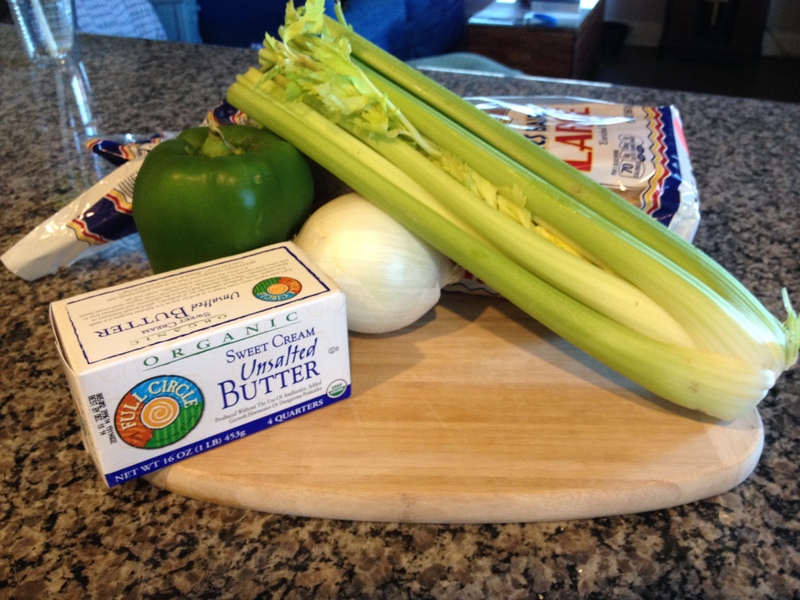 Ingredients for the perfect Thanksgiving side dish. 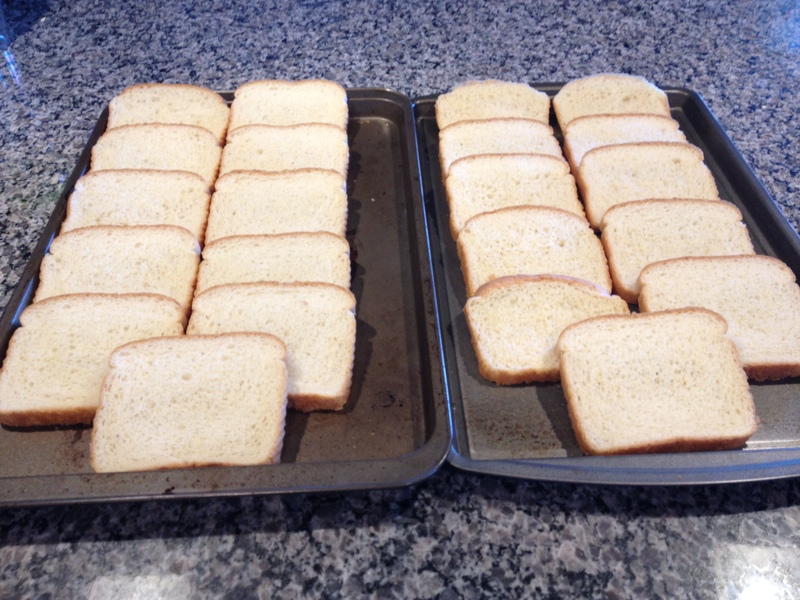 Bread all laid out and getting its crunch on. 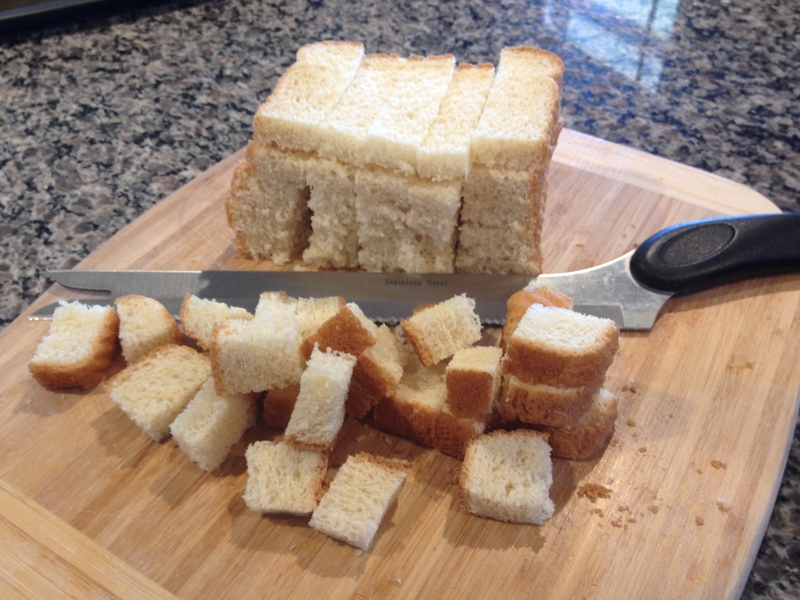 Cut bread into half-inch cubes. Place into a large bowl for mixing. I use a large pot. Cut bread into cubes. This is when that bread knife comes in super handy! Add in bell pepper, celery, onion, salt and pepper. Gently toss together. This is where the fluctuations in measurements start to come in, as it really is by feel and what you like. It’s equal parts bell pepper, onion, and celery. Feel free to ratchet up or down based on your tastes. One pile of yumminess. Let the mixing begin. Add about half of the butter and water. You won’t want to add it all just yet. Using your hands start blending it together, like your are working dough. Keep working it and add the remaining butter and water if needed, until the mixture can be formed into muffin sized balls that will hold together. 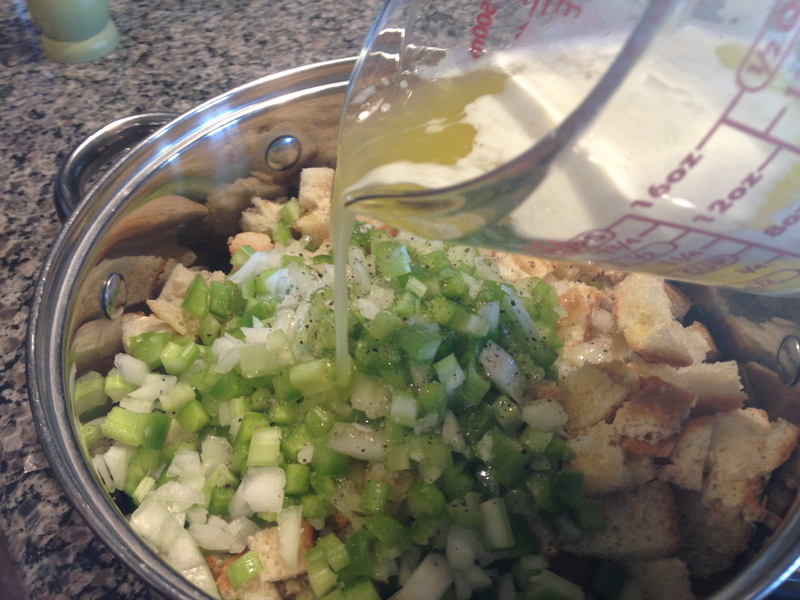 Pouring in the butter. Who doesn’t love butter? And for the holidays, we’re sure it’s calorie free. Place stuffin’ muffins into a muffin pan. You should have 12 muffins, perfect for one pan. You won’t need to grease the pan, due to the butter in the muffins. What the mixture looks like after mixing. Bonus, the butter will make your hands nice and soft. Stuffin’ muffins in the making – formed into muffins of perfection. Cover with tinfoil. Bake for 30 minutes. Uncover and bake for 5 to 10 more minutes until golden brown. Let cool for five minutes. Spoon each muffin out of the pan and serve with your favorite gravy. Ready for the oven, and the countdown begins. Golden perfection. Stuffin’ muffins for everyone! One plate of deliciousness. Stuffin’ muffins served with gravy. Who doesn’t love gravy? We usually double this recipe for family gatherings. We plan on at least 2 muffin per guests. Of course you can always make more as they are great as leftovers. If you have leftovers, wrap muffins in a damp paper towel and microwave for 30 to 45 seconds. Thanks so much for the kind words. I will definitely check out your blog and greatly appreciate you checking out mind. And yes, small world! Thanks so much. Try it out and let me know what you think. Hugs sweet friend!